Zinnias are annuals, native to Mexico belonging to the daisy family. These plants are a great addition to a summer garden as they produce brightly coloured flowers on long stems. The height of the plant varieties varies from 4 inches to 40 inches depending on the variety. These plants have opposite leaves, which are pale green in colour. The flowers come with single row petals to multilayered petals. Zinnias plants are very easy to grow and they grow very quickly. These are heavy bloomers and the flowers are long lasting. They make good cut flowers. They attract butterflies and bees to your garden. The taller varieties of Zinnias are ideal for mixed borders and smaller varieties are good for creating edges and for containers or window boxes. The different varieties are Benary’s giant with big, bright flowers, a gold flame which is mid-height variety, old -Mexico with double flowers and crystal series which are drought-tolerant. The best way to grow Zinnia is to start the plant from seeds. These plants do not usually thrive transplanting. If the conditions are appropriate, they can grow faster from seeds. Wait till the last frost disappears to sow the seeds directly in the garden bed. Select allocation in the garden which receives at least 7-8 hours of bright sunlight. 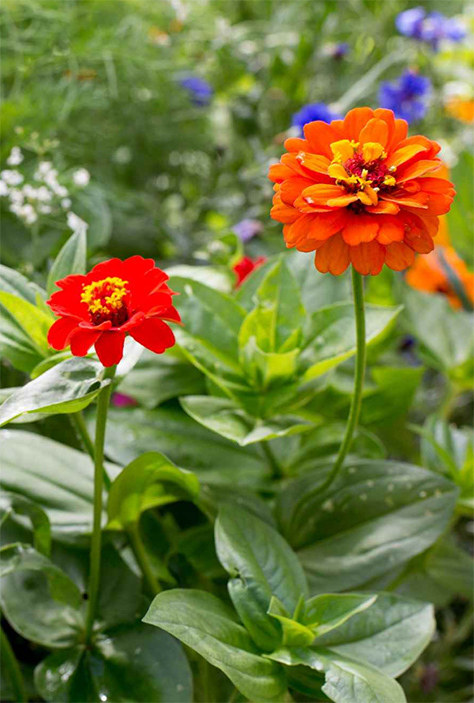 Though Zinnias can grow in any type of soil, it prefers humus-rich and fertile soil, which is well drained this will do wonders when the plants are flowering and established. The preferred pH is from 5.5 -7.5. Amending the soil with lots of compost helps the plant in producing flowers more quickly. Do not sow the seeds deeper than ¼ inch in the soil. To backfill, just cover the soil over the seeds slightly, so that the seeds can germinate in the dark. With a good batch of seeds, seedlings should start to appear within 5-7 days. If the seeds are outside the use by date then, seed germination could take a little longer but don’t loose faith. Once the seedlings reach 3 inches in height, first prick out the weak and spindly seedlings so that there will be 6- 18 inches of space left between them. Once the seedlings reach a height of one foot you can pinch out the top of the seedlings, this will make them branch out. You can do this a few times within 2 week intervals. In the long run, this will make the zinnias a much thicker plant and this will make them develop extra flowers making them exceptional performers. Zinnias need great air circulation, this will keep them happy and healthy through the season. Sowing seeds in succession in the garden will ensure good display of flowers for a longer period. How to care for Zinnias? To ensure proper growth and flowering of Zinnias you need some outdoor care to maintain soil moisture at a moderate level do not keep the soil soggy. Once mature the plants require less watering. Try to keep the foliage and petals dry when watering the plant to avoid the attack of powdery mildew. Deadheading, routine removal of the flower stems and clipping back the plant results in abundant flowers. These annuals will die off after the first frost. To save the seeds, clip off the dried flower heads of the plants you want to propagate. Pack the seeds of different flower colour in separate marked envelops and store in cool, dry place till the growing conditions will return the next year. The common diseases of Zinnias include powdery mildew, fungal spots, bacterial spots, and bacterial wilt. Etc. the best way to avoid these diseases is to minimise wetting the foliage of the plants and providing good spacing between the plants. The pests that attack Zinnias include spider mites, mealy bugs, caterpillars. It is better to avoid spraying pesticides unless the situation is severe.